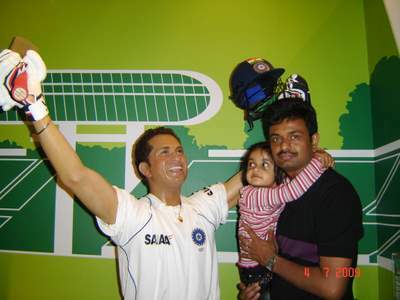 I am becoming nostalgic reading about Sachin Tendulkar, SRT. I was very angry when I wrote this post because a friend of mine has criticised SRT. So, please help yourself. Wait a minute. I have almost forgot to write about Dravid. Shot of the match was played by him. ( even second innings is not played). Inside out to extra cover for 6. By the way, today Tendulkar was wearing jersey no. 33. I got a chance to get photographed with my hero at Madame Tussaud’s too.